A true promise of purity and wholesomeness. * All India (Urban+Rural) Market Share of Aashirvaad Atta based on Nielsen Retail Audit MAT May 2017 2018. ITC entered branded atta market with the launch of Aashirvaad Atta in May 2002 and within a short span became the No.1 branded packaged atta across the country. Aashirvaad promises you only the most delightful rotis straight from your kitchen complete with love and care through your preparation. * All India (Urban+Rural) Market Share of Aashirvaad Atta based on Nielsen Retail Audit MAT May 2017. Aashirvaad Salt is made from the goodness of natural sea salt crystals. After naturally drying under the sun for three weeks, the salt is cleaned and crystalized keeping the goodness of nature intact. At Aashirvaad, we take extra care to ensure that only superior quality ingredients reach your kitchen. Aashirvaad Svasti Ghee is made using a special 'SloCook' process that enhances its natural aroma, giving it a distinct flavor profile. With its wonderful aroma, rich granular texture and consistent quality, Aashirvaad Svasti Ghee lends itself beautifully to varied Indian cuisines, making it a must-have in every household. Currently, Aashirvaad Svasti Ghee is available in the markets of Tamil Nadu, Puducherry, Karnataka, Kerala and Delhi (including NCR). ITC forayed into the branded spices market with the launch of AASHIRVAAD Spices in May 2005. The offering currently consists of Chilli, Turmeric, Coriander, Cumin, Garam masala and Koora Karam powder AASHIRVAAD Spices, operating in selected markets of south, east and north, have spread to a large consumer base and have emerged as a major player in basic spices in most regional markets. The spices are sourced directly from the farmers and selected by experts to ensure the right aroma, pungency and colour. 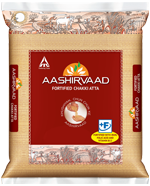 Convenience and authentic taste now has a new name with the Aashirvaad Instant Mix range. This range, launched in March '06, now includes Gulab Jamun, Rava Idli, Rice Idli and Rice Dosa. Aashirvaad Instant Mixes promise the discerning Indian homemaker perfect tasting dishes, consistently. The Rava idli Mix is available in 500g pack and rest of the products are available in 200g packs.